Let us introduce you to the best Greek cabernet. The nose is true to Cabernet with a bit of leather, currants and blackberries. It contains soft tannins and deep structure. The wine is dry yet gentle for a Cabernet. We extended the barrel aging to make it extra smooth! All Georgos wines are handcrafted in small batches with premium, imported and sustainable fruit with no added sugar and low sulfites. This wine is named for the ancient Greek island (circa 3,800 BC) of Ithaka, once ruled by Odysseus, also known by the Latin name Ulysses. He was the legendary Greek king of Ithaka and a hero of Homer’s epic poem the Odyssey. ITHAKA is made from hand-picked and triple hand sorted fruit. Like all Georgos wines we hand-pick and hand-sort the grapes to reduce pathogens and toxins that can cause an increase in histamines in the wine. We use only enough sulfite to protect the wine from oxidation, leaving none left over to affect the consumer. We use organic production methods and we aged it almost one year in the barrel for extra smoothness. Simply delicious! It is gently low pressure pressed. We use about 35% new oak, 55% from France, 20% from Hungary and 25% from Pennsylvania forests. While aging, the wine is tasted and tested regularly and the barrels topped every three weeks. 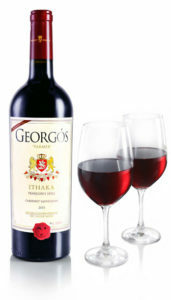 The wine is clean, has no preservatives and was processed without anti-microbial chemicals. If you want to know what a Greek style cab varietal should taste, this is it. The nose is true to Cabernet with a bit of leather, currants and blackberries. It has soft tannins and deep structure. The wine is dry yet gentle for a Cab. It’s perfectly balanced and delicious.